They name that mask Messenger, that’s telling the people to come.... Just like a bird, you know, flying ahead of the people to deliver the message. The central face of this Deg Hit’an mask resembles Giyema (Mask Dance) messenger masks used at Anvik in the 1930s, and the overall shape with its tail and wings may represent a crow. The collector labeled the back “Te-yequ / water shadow.” Runners wore masks on their way to other villages to extend invitations to the Giyema ceremony. The festival was performed to increase the abundance of animals and to “put down” gifts that honored others. Dances and masks portrayed animals, birds, fish, and humanlike beings, such as One-Eyed Man, Jumping Men, the Half-Man, Up River People, and the Old Man. Trimble Gilbert: That’s a good one. Phillip Arrow: This part [central face] right here, they used to use it for the Messenger [Feast] or something. They make it small though. They tie it right here [to face]. They go to another town and they tell the old people, that’s why they say Messenger. They name that mask Messenger, that’s telling the people to come. But this part [tail feathers] is maybe something too. Looks like crow. I bet that’s what it is, because I’ve seen some crow masks, had this kind [central face] of design on it. It’s not carved in like that though. On the ones I’ve seen, the design is painted on with something. Eliza Jones: Oh, it could be like a crow. So this is its wing, and this could be its tail. Judy Woods: And its nose [beak] right there [below face]. Eliza Jones: So you would have the same word for that mask? Phillip Arrow: Giyema k’idz [small mask] they call it. 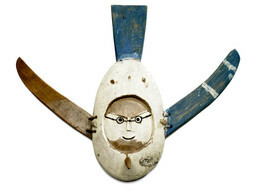 K’idz means “small,” giyema means “mask.” I mean this one [central face]. Aron Crowell: What do the glasses mean? Why do they put the glasses on the faces? Phillip Arrow: I don’t know why they put that. I use it too on the ones I make. I’ve seen those old masks used with that kind of line, the glasses. I copy those. Eliza Jones: So, what kind of wood do you think this is? Phillip Arrow: It’s painted. It’s hard to tell. Maybe you can tell by this one [red wing] though. That’s spruce tree look like. Trimble Gilbert: It looks like one of these [wings] broke off, and maybe they replaced this [red wing]. It’s got to be same [blue] color on this side [red wing]. Well, this makes me think on the Messenger meet that you have to be ahead of the people, send the message out. Maybe that’s why it’s just like a bird flying, maybe ahead of the people to deliver the message. Judy Woods: And crow, they say, is a messenger. Eliza Jones: Yes. In our tradition, in the stories, the dotson’, the “raven” was always the chief, even though he’s a scavenger and sometimes does silly things. And you know in the stories, you kind of ridicule it, but still you have lot of respect for it. Judy Woods: Mm-hmm, even now we have. The Mask Dance was performed to increase the abundance of animals that were hunted for food, and as an opportunity to “put down” gifts that honored others and added to the prestige of the giver.